Serena Williams’ fear factor isn’t gone. It has just found a new victim. She isn’t scaring other players anymore. Instead, she’s scaring herself. It happens. Your name, your history, your age, your reputation, your legacy. It can pile up and be frightening This is my take, anyway, from watching her lose 1-6, 6-3, 6-4 Saturday to Alize Cornet in the third round at Wimbledon. That makes three majors this year, and Williams hasn’t even made it to the quarterfinals of any of them. She has a serious problem, and deep down, she realizes it. Most likely, that’s what’s scaring her. After losing at Australia, somehow it slipped out that she had an injury and almost didn’t play. At the French? Well, that’s her worst surface. At Wimbledon? Sorry, no more excuses. Not there, where Williams has won five titles and Cornet is still figuring out how to play on grass. What stood out about this match was Williams’ complete lack of joy, even when things were going well. Never one smile, never even an upbeat hint of body language. There was emotion, anger, near tears. Williams looked as if she just did not want to be there. That might be the scariest thing of all. This is a stepladder going down for Williams. The shocking losses the past year have built up and gradually led everyone, Serena and the other players on tour, to the next step. The message is this: Serena can be beat. Over the past few months, we saw her opponents start to believe. Williams’ ability to bully was fading. 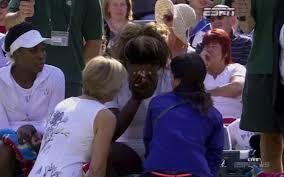 But in this match, it looked as if Williams had taken another step down. 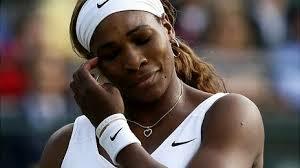 It is not just that her opponents believe they can beat her, but also that Williams is afraid to lose. Martina Navratilova used to talk about this as she got older. She’d say that younger players could swing away without fear, that they didn’t grasp how big things are or what could go wrong. Even Roger Federer, who, at 32 is the same age as Williams, said on ESPN Saturday that when you get older, the losses seem to be bigger. The important thing, he said, is that you continue to believe that the outcome of your matches is in your hands, on your racquet. Not on your opponents’. He said he feels that way and is sure Williams does, too. I think Williams is grappling with this entire formula. Part of her still seems to think that sooner or later, she will win these matches. But part of her can’t figure out why her opponents aren’t eventually buckling.